In this article, I have a tip for deploying Nuxeo customizations developed using the Nuxeo Eclipse IDE. But first let me first mention a few things about how to go about customizing Nuxeo. Nuxeo Studio is a cloud-based configuration tool. It's available by subscription, but it's not required to have in order to use Nuxeo. Actually, without Studio you don't miss out on any of the cool end-user Nuxeo product features, but by using it, you can save yourself a tremendous amount of development and administration time, and you'll also know that your configurations made in Studio are guaranteed to be automatically upgradable to future product versions of Nuxeo. Nuxeo without Studio is much harder. If you don't use Studio you'll need to hand-code and debug quite a few configuration files. That can involve writing a lot of XML, XHTML and other code, easily hundreds of lines of code even for simple configurations. And while manually creating those files isn't really that complex, writing those files can be tedious, and it's easy to introduce syntax errors while writing them that may end up later costing you many hours of time trying to track down and fix. You can do a lot with Studio, and if you're serious about Nuxeo, you really should use it. We've found, for example, that most projects we work on start out by developing a custom content model and designing associated create, view and edit forms. With Nuxeo Studio, an analyst could easily build and test the content model and all associated forms without needing assistance from a developer. Studio also allows you to graphically design workflows, set up automation tasks, and a lot more. For many installations, using Nuxeo Studio for configuring your application is sufficient, but if you need to do even more in-depth customizations than what Studio lets you do, you can use Nuxeo's Eclipse plugin. 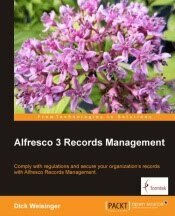 Nuxeo has great on-line documentation showing you how to use it. Unlike Studio, the Nuxeo IDE is a tool that targets Java developers. 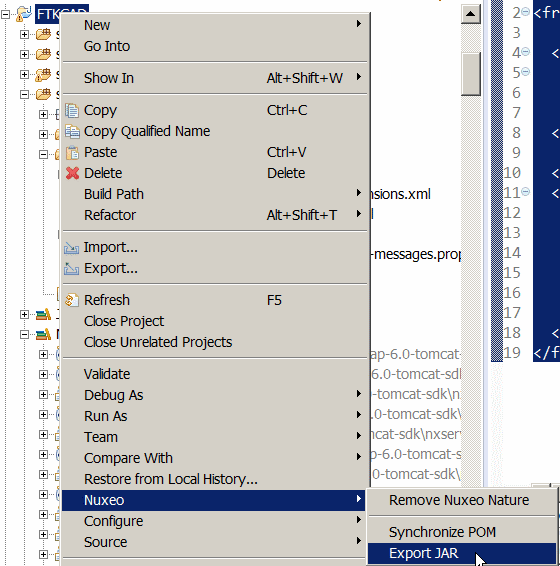 Using the Nuxeo Eclipse IDE you can extend and override parts of the Nuxeo application. From a Nuxeo perspective within Eclipse you can create a Nuxeo project and then add artifacts to it. You can then deploy your project changes, launch Tomcat and run and debug the Nuxeo application, all within the Eclipse environment. It's easy to hot reload Nuxeo projects within Eclipse using the Nuxeo IDE plugin. That feature really speeds up development. But when deploying your IDE-developed customizations to a new Nuxeo instance, there's an additional deployment file that you need to have in your project. Nuxeo has an option in the IDE to jar all the files of your project. To deploy your changes, you just create the jar and then drop it into the nxserver/bundles directory of your new instance and restart. The option to jar is available by first right-clicking on your project in the Eclipse Nuxeo perspective and then selecting Nuxeo and Export Jar. That's easy enough. But there's one more thing you need to do to prepare the jar file for deployment on another server, and if you don't do it, you're likely to run into problems. This step isn't needed when you're developing and deploying from within Eclipse and is easy to overlook when reading Nuxeo's explanation for how to use the Nuxeo Eclipse IDE. Every time Tomcat is restarted, the nuxeo.war directory under nxserver will get redeployed and expanded. Because of that, any files you may have attempted to manually add to the nuxeo.war area after a deployment will be lost the next time the war is redeployed. 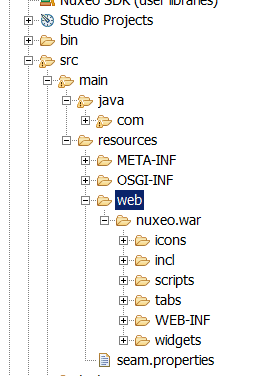 A feature of the Nuxeo Eclipse IDE is that after the war is expanded, the project's web asset files from the src/main/resources/web directory of your project will be automatically copied into the war area, modifying the standard Nuxeo instance with your customizations. You can see that the install section of the code unjars your bundle and copies over all assets that are under the web directory of your project to the corresponding area of the expanded nuxeo.war. That's it. 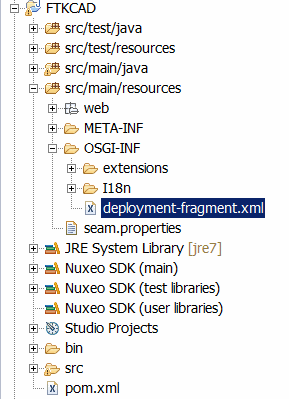 With the deployment-fragment.xml file in place, your bundle will be correctly deployed into the target Nuxeo instance when Tomcat starts up.